“High School Musical” star Ashley Tisdale and her husband Christopher French go Christmas shopping at Chanel in Beverly Hills, California on December 19th. Ashley will be returning to “Young & Hungry” next year as lesbian magazine editor Logan Rawlings. Ashley Tisdale Gorgeous In Hollywood Reporter Shoot — Pics Here!! Ashley Tisdale looks hot in leather pants as she poses for a photoshoot in November for the Hollywood Reporter. Check out more pics from the shoot and let us know your thoughts. Ashley Tisdale was spotted leaving Andy LeCompte Salon in West Hollywood, California on October 21st. Ashley looked lovely with gorgeous long, honey blonde locks while rocking ripped jeans and a rock n’ roll leather jacket and boots. What do you think of her new hair do? Ashley Tisdale Spotted Out And About In Studio City Yesterday – Pics Here! Ashley Tisdale was spotted rocking a fashionable yet casual look as she walked around Studio City, California yesterday, October 19th. Ashley wore a gray sweater, ripped blue jeans, a hat and sunglasses, with a black bag to accessorize. We hope she had a nice, relaxing weekend! Ashley Tisdale Spotted Out In West Hollywood – Pics Here! Ashley Tisdale was spotted wearing a rock n’ roll casual cute outfit as she ran errands around West Hollywood, California on October 16th. Ashley rocked a classic “parental advisory” shirt, blue jeans and flats as she hurried walked by the cameras. Ashley Tisdale + Vanessa Hudgens Have A Post Workout Chat — See The Pics! High School Musical co-stars Ashley Tisdale and Vanessa Hudgens were spotted in sporty attire chatting it up after their workouts in Studio City, California today, October 16th. Check out more pics of these beautiful gal pals below! 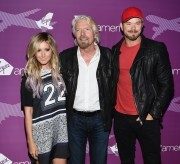 Ashley Tisdale attended airline Virgin America’s special Dallas Love Field Launch Celebration in Dallas, Texas on October 13th. Ashley rocked a black and silver jersey inspired dress and posed with friends as well as VA flight attendants on the red carpet as well as throughout the event. It looks like everyone had a fabulous time! Have you ever flown Virgin Airlines? We can’t wait to see what awesome features and places VA has included the next time we travel. Ashley and the fellow attendees were all smiles as they posed and played with mini models of the planes. What a fun event! Ashley Tisdale Hits The Street In Los Angeles – Pics Here! Ashley Tisdale looked radiant in white on October 6th at she hit the streets of Los Angeles, California. Ashley rocked Love Pink tee as she chatted on the phone and stayed cool in the shade despite the LA heat. Check out more photos of Ashley’s street style below! Ashley Tisdale Spotted Out And About In Studio City! – Pics Here! 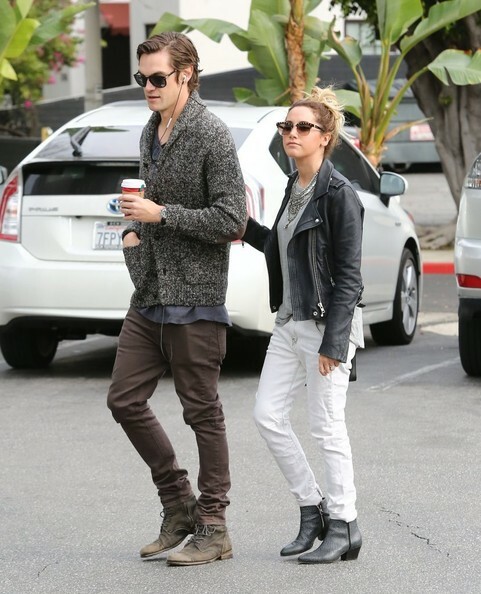 Ashley Tisdale and her husband Christopher French were spotted out and about in Studio City, California on October 5th. The dynamic duo kept cool with Starbucks on their day out together and both rocked some bright and bold fashions including Ashley’s pink tank and Christopher’s polka dotted navy blue pants. Check out more photos of Ashley and Christopher out on the town below!